For the first time in my 100 posts, the accompanying photo makes no attempt at humor. There is no lazy PhotoShopping, trademark thievery, or aspiration of ingenuity. Instead I am presenting the face, neck, arms, and torso of the anti-vaccination movement. This is the principle they are fighting for. This is the result of demanding freedom to infect infants and children. 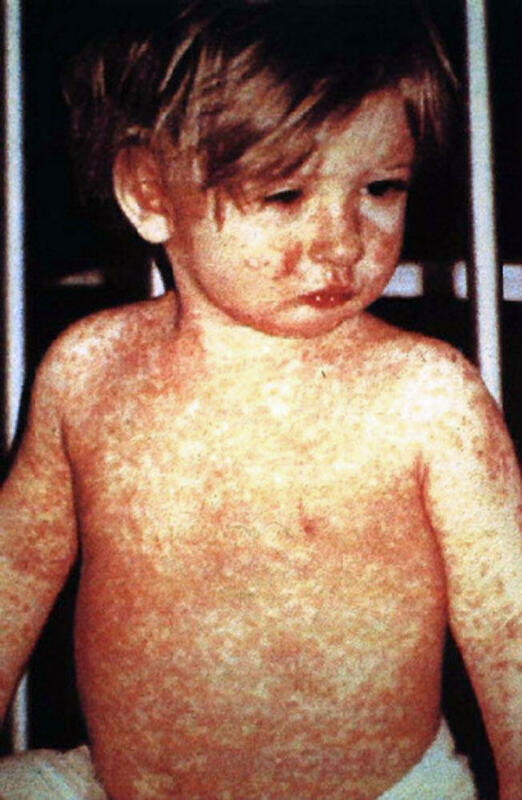 This is a boy with measles, a disease declared eradicated in the United States 15 years ago, but which was spread at Disneyland thanks to the anti-vaccination movement. The U.S. is once again home to a highly contagious disease that kills over 100,000 children annually and leaves others blind, deaf, and brain damaged. Christopher Ingraham and Jason Millman of The Washington Post put together a map of measles vaccinations rates and noticed those not immunized were clustered in wealthy Southern California communities. When many unvaccinated persons are congregated, a serious issue becomes much worse. It’s not just the offspring of the willfully defiant who suffer. Also impacted are those too unhealthy to be vaccinated or those too young, such as the six infants who were Disneyland victims. There is also the rare person for whom a vaccine will be ineffective, and they are at risk if they encounter someone diseased. The anti-vaccine movement defies political categorization. It afflicts alternative medicine leftists, religious conservatives, and libertarians insistent on keeping the government away from all health decisions. But there is nothing progressive in denying science and causing some public schools to become disease incubators. There is nothing conservative about equating the eradication of disease with socialized medicine and government overreach into parental domain. There is nothing libertarian about allowing one person to harm another or to infect the vulnerable. One anti-vaccination parent told The New York Times why she refused to vaccinate in the wake of the measles outbreak. She also ignored a doctor’s advice to have her son receive a tetanus shot after being cut. She said, “It’s good to explore alternatives. Vaccines don’t feel right for me and my family.” Science is based on facts, not feelings. And alternatives are for selecting a living room carpet, not for gambling with your child’s health. Denial such as this is a growing public health menace that results in unnecessary suffering and death for children. It is irresponsible for Chris Christie to present this as just another lifestyle choice on par with which car to drive or what hobbies to embrace. It is abominable that Rand Paul, a doctor, would say, “I have heard of many tragic cases of walking, talking normal children who wound up with profound mental disorders after vaccines.” This assertion is without merit, but gained traction after a study in the Lancet medical journal. This article has been discredited and was redacted in 2010. While the anti-vaccine throng is a small percentage of the country, it is creeping dangerously close to impacting the herd immunity threshold. This is the vaccination rate required to prevent disease outbreak. The threshold is between 75 and 94 percent, depending on the disease. The measles outbreak was the manifestation of vaccinations dipping below the threshold in impacted areas. Diseases have been a main cause of death, illness, and disability for all of history. But germ theory and the advent of vaccination curtailed this immensely, tackling mumps, measles, smallpox, polio, and much more. But the anti-vaccine movement, based on unfounded fears, bad science, and celebrity endorsers, has caused a decline in immunizations and a rise in preventable diseases. In the United Kingdom, vaccination rates for Whooping Cough were cut almost in half, leading to deadly epidemics in 1978 and 1982. In the Pacific Northwest, the disease skyrocketed by 1,300 percent in 2012 after vaccination rates plummeted. In California, 10 children died from Whooping Cough in 2010, the result of parents who refused vaccination. By contrast, instances of Hib meningitis have gone from 15,000 a year to 50 since a vaccine was developed. More than 15,000 Americans died from diphtheria in 1921, whereas there has been one case in the United States since 2004. In 1975, rubella affected 12.5 million Americans, causing 11,000 miscarriages and 2,000 infant deaths. In 2012, there were nine rubella cases reported in the country. These numbers are not post hoc reasoning because we understand how the immune system works and we know the science behind vaccinations. Rare side effects can occur, but the regulatory process ensures they are within an acceptable risk boundary. Hence, vaccination is statistically much safer than letting a disease rage unchecked. For instance, adverse reactions to the HPV vaccine were reported by four-tenths of one percent of those vaccinated. These reactions were mild, such as headaches, nausea, sore arms, rash, and dizziness. Reactions are no reason to abstain from vaccination since complications are far more likely to arise from illness than being inoculated. The FDA ensures that new drugs work and that benefits outweigh risks before they are made available. Drug companies seeking to sell a drug in the United States must test it, then send results to the FDA. There, physicians, statisticians, chemists, and pharmacologists review the company’s data and proposed labeling. If this review shows the drug’s benefits outweigh the risks, it can be sold. Going back to how this infects the entire political spectrum, some vaccine deniers prefer untested, “natural” remedies, some prefer to rely wholly or partly on prayer, and others think vaccinations are an attempt to control citizens. These views tend to be deeply entrenched and denial of science runs strong. Acerbating the problem is that persons can seek refuge in likeminded Internet communities, where rejection of health advancement is lauded. Also, vaccines are a preventive measure, not a treatment, making them a more abstract concept for some. Vaccine denial was almost unheard of when nefarious diseases were common. Another issue is false balance in media. Presenting all sides of the issue is necessary to political reporting. Without balance, it’s not journalism. But when reporting science, only facts should be presented. When celebrating the moon landing, the media doesn’t give equal time to proponents of the hoax theory. But it will present two talking heads when the issue is vaccination, giving the false impression the scientists and doctors are in disagreement, when the overwhelming majority favor vaccination. There is one incidental benefit to false balance. It exposes anti-vaccination leaders such as Dr. Jack Wolfson. When asked on CNN about the leukemia patient who was at great risk from measles because she could not be vaccinated, Wolfson retorted that vaccines had probably given her the cancer. That’s the side we’re fighting against.